Tyler Van Leeuwen helped to expand and streamline the investments made by the adidas Group’s internal Energy Efficiency Venture Capital Fund. The adidas Group hosted Tyler Van Leeuwen as an EDF Climate Corps fellow in 2013 to help expand and streamline the investments made by the adidas Group’s internal Energy Efficiency Venture Capital Fund, the greenENERGY fund. The fund takes a portfolio approach to investing in strategic energy efficiency opportunities in adidas’ real-estate portfolio and has chalked up impressive success in its first 14 months - On $2 million invested, the fund has returned over 55 percent. His fellowship supervisor, Elizabeth Turnbull Henry was herself an EDF Climate Corps fellow at the adidas Group and a graduate of the Yale School of Management and School of Forestry. Over his 11 week fellowship, Van Leeuwen developed the adidas Group Global Energy Audit program, which will enlist a global engineering and energy auditing firm to perform detailed studies of 18 of the adidas Group’s owned and leased buildings. The goal is to provide each facility with a roadmap of energy efficiency projects and business cases, complete with vendor quotes for viable projects. As a part of this work, Van Leeuwen wrote the project request for proposals, interviewed potential contractors and developed a global energy financial model to justify investment in the project. His analysis suggests that the Global Energy Audit Program could achieve a 6-8 percent reduction in energy use at the addressed facilities, which equates to over 5 million kilowatt hours of avoided energy use each year. Through interviews with Facility Managers of adidas Group Offices, Warehouses and Production facilities worldwide, Van Leeuwen also developed a template for communicating information about successful energy efficiency investments to facility management staff. 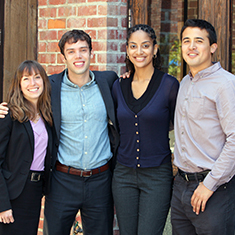 Tyler Van Leeuwen, a student at Yale University, was hired as the 2013 EDF Climate Corps fellow at adidas.